Two of the biggest problems faced by Tulsa, Oklahoma business and home owners today are inefficiency and downtime due to illness. Both of these problems can be addressed in part, believe it or not, by taking advantage of our AC duct work and chimney cleaning services. Most of us who live and work in the Tulsa Oklahoma area understand our heating systems and what your chimneys are for. The chimney on top of your home or office building removes the smoke and other harmful gases expelled by your heating system. If you heat with gas, oil, coal or wood then you have some sort of flu or chimney that needs to be cleaned at least once a year. A chimney packed with creosite and soot reduces your heating systems efficiency and the life of your flu system and increases the risk of a chimney fire. In fact, some insurance policies require that you have your chimney and flu system inspected and cleaned at least once a year. For more information on our chimney and flu cleaning services please click here. Most of us do not stop and think about our AC vent system very often unless there’s a problem or it’s time to clean the filters, but believe it or not, a dirty air-conditioning vent system can decrease the efficiency of your cooling system and increase health issues pertaining to seasonal allergies. 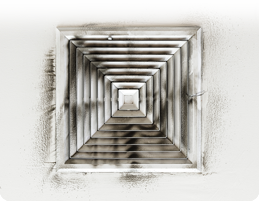 Dust dirt and other tiny debris particles are removed from your home via your air-conditioning duct system. Unfortunately not all of these particles make it to the filter. Dust, pet hair and other airborne particles can stick to the inside of your air-conditioning duct system and end up right back in the air of your home. Those who suffer from allergies, regular illnesses like colds and asthma will find they suffer much less when the AC vent system is cleaned on a regular basis. The rest of us will be amazed at the increased efficiency of our units. For more information about AC duct system cleaning please click here.